Why did Warren Buffett tell his limited partners on May 29, 1969, that he was liquidating Buffett Partnership, Ltd.? As is the case with most decisions made by Buffett, there’s the written or spoken message delivered publicly that explains his reasoning. And then there are the moving parts under the hood, the actions that speak louder than words and the things left unsaid. Let’s first see what was declared publicly in writing. Bargain securities based on quantitative valuation metrics are pretty much gone. BPL’s assets under management have swelled to $100 million, making the discovery of bargains even more difficult. Requiring a minimum 3% portfolio position to move the needle would mean scanning the universe of companies with at least $100 million in market cap. Both Wall Street and retail investors heavily screen this universe, making bargains among such larger companies more difficult to find on a regular basis. The market and its participants have become obsessed with investment performance, leading to a more short-term focused and thus more speculative market. The fourth and last reason is the most important. BPL modified its objectives 18 months earlier in a letter to limited partners dated October 9th, 1967. 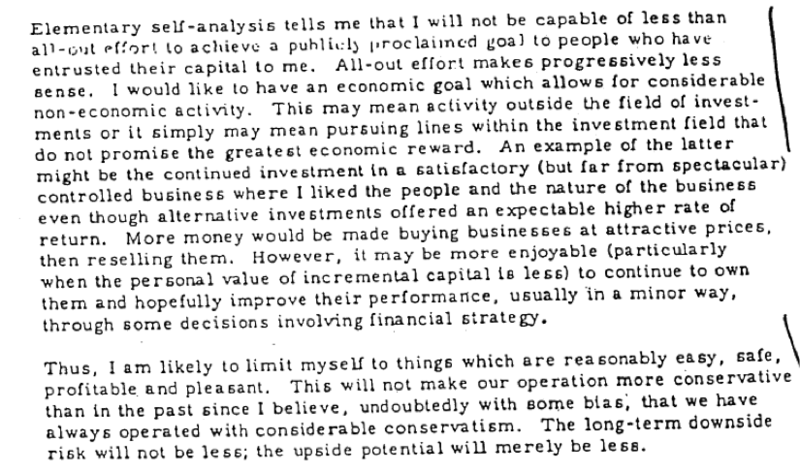 The more conservative expectations for investment performance were put forth in this 1967 letter with the intent of freeing up more time for Buffett to spend on non-BPL activities. The idea was that BPL would go for lower returns, which would take less time and resources to generate. But, this hasn’t turned out to be the case. BPL still consumes too much time. This desire to focus on non-BPL activities requires Buffett to wind down BPL. What are these non-BPL activities? The October 9th, 1967, letter sent to limited partners 18 months earlier provides some clues. In that letter, Buffett writes, “I would like an economic goal which allows for considerable non-economic activity.”  One might think such non-economic activity to be things like playing golf, doing more charity and volunteer work or other similar activities where economic gain is a non-factor. But, that’s not what he meant. What he meant was he didn’t want to work as hard managing others’ capital, trading in and out of securities every single year to generate returns; however, he still very much wanted to pursue economic gain, especially for himself. From looking at the content of both the May 1969 and October 1967 BPL letters, a reader might think Buffett didn’t want to select investments as frequently anymore or that he was tired of the investing game. But when one looks under the hood and the things unsaid, it becomes clear he was just getting started. The timing of the October 1967 BPL letter to limited partners says a lot. In March 1967, Berkshire Hathaway, a company in which BPL had 25% of its capital invested, had just acquired an insurance company called National Indemnity Company (“NICO”) and its sister company National Fire & Marine for $8.6 million. With the insurance company, Buffett all of a sudden had a way to invest in bonds and stocks on a levered basis with capital that did not belong to limited partners or outside investors clamoring for short-term, outsized returns. The investable capital consisted of insurance premiums belonging to policyholders coupled with capital belonging to shareholders of the insurance company (i.e. Berkshire Hathaway). If his holdings went down, he didn’t have to explain the declines to LPs and or risk fickle LPs redeeming their capital. So it’s not surprising that 8 months later in the October 1967 letter to limited partners, he might have started to become conflicted as to what he wanted to focus on: Selecting investments for the investment partnership or the insurance company? By saying he was going to pick more boring, easier investments for BPL, he might have been killing two birds with one stone because these were the exact types of investments best suited for NICO. In 1967, NICO’s common stock investments were worth $6.3 million, up 2.8% from their initial cost of $6.2 million. This doesn’t sound like much, but it’s likely that Buffett immediately saw the enormous potential of this portfolio, because the 2.8% return was an unlevered return with a very small allocation to stock investments. In 1968, which marked the first full year of Berkshire owning NICO, the stock portfolio of NICO increased from its cost of $6.3 million to $8.1 million, a 28.0% unlevered return. The book value for NICO at the beginning of 1968 was $7,557,864. Based on this beginning of period book value, the value increase in NICO’s stock holdings represented a 23.3% levered return on equity. Why is it lower on a levered basis? Because the allocation to common stocks as a percentage of the portfolio is relatively low, with bonds comprising the bulk of the portfolio at $27.2 million at the end of 1968. But…if this asset allocation had been twice its size, around $12.6 million cost rising the same 28.0% in value to $16.1 million, this same return of 28.0% from stocks would have contributed to a return on equity of 46.7% ($3,528,944 / 7,557,864 = 46.7%). This is not to suggest that such an immediate, higher allocation would have been wise, but the long-term potential for levered returns from investing in stocks with limited downside and moderate, yet compounding upside is evident. Considering that the S&P 500, including dividends, was down 8.4% in 1969, it looks like Buffett was adding to some existing common stock positions that declined, and perhaps he initiated some new ones. The balance of NICO’s common stock portfolio had declined 8.5%, in line with the rest of the S&P 500’s decline. An 8.5% decline in the value of stock investments that was in line with the broader stock market’s decline would have been intolerable for Buffett at BPL – such a decline might have been even more intolerable for the short-term minded LPs invested in BPL. Buffett might have suffered redemptions, and his track record would have been tarnished. But, here within the structure of NICO (and thus within Berkshire Hathaway), he did not have to deal with the pressure of having to explain such declines to LPs invested in Buffett Partnership, Ltd., had it suffered a similar negative 8.5% annual return. He could actually get excited about an 8.5% decline in the stock portfolio consisting of great, long-enduring companies that compounded earnings. The market mispricing of the stocks of these companies would not be a burden as they might have been as an existing, mark-to-market holding within BPL. Buffett is held accountable to shareholders of Berkshire, for certain, but this shareholder capital was permanent; shareholders of Berkshire could not redeem their capital like the LPs of Buffett Partnership, Ltd. It could be traded in the secondary market at lower and lower valuations. But once the initial equity funding came in the door, it wasn’t callable by the equity investors. The only constraint was in the eyes of insurance regulators and ratings agencies, but even then, these institutions are not entrusting capital to Buffett while expecting a certain return on their investment. As long as insurance policyholders were likely to be made whole in the payment of their claims, these bodies were satisfied. Furthermore, the providers of capital, the insurance policyholders, don’t care (or know) that their premiums are being invested; the only “call” they have on that capital is when a claims-inducing event occurs. In summary, what was said – in 1969, Buffett decided to liquidate BPL as he found investing bargains hard to come by where BPL could generate returns comparable to what was achieved annually since 1957, as the market had become increasingly efficient, more prone to speculative bubbles and BPL had gotten too big – was only part of the picture. Warren E. Buffett, Buffett Partnership, Ltd., letter to limited partners (May 29, 1969), p. 2. Warren E. Buffett, Buffett Partnership, Ltd., letter to limited partners (October 9, 1967), p. 5. Berkshire Hathaway Inc. (1968). Form 10-K 1968. Berkshire Hathaway Inc. (1969). Form 10-K 1969.